Last night I had a dream that I hugged Susan Feniger. Oh wait, that really happened! 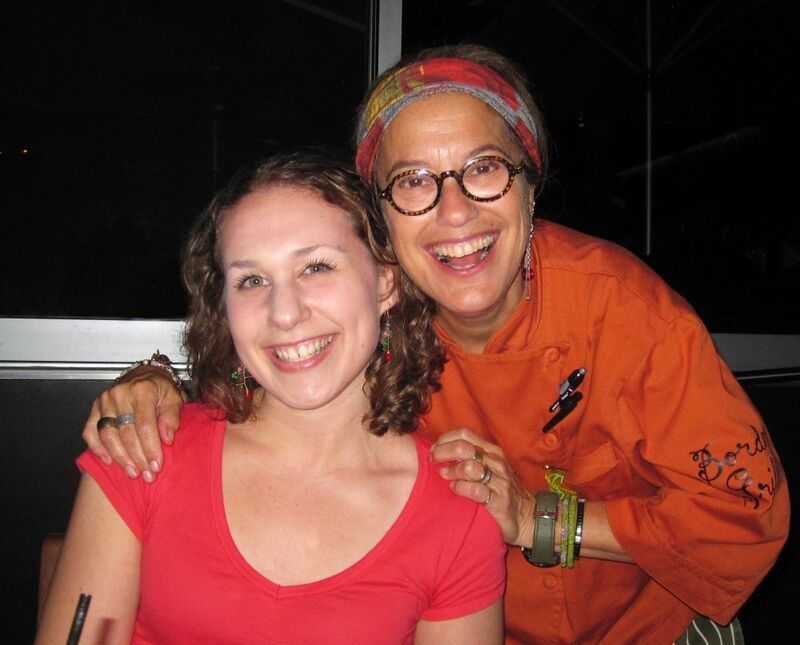 Me with Susan Feniger! THE Susan Feniger! Last night I had dinner with 6 awesome friends (Maya, Tara, Caroline, Esther, Lindsay, and H.C.) at Street, Susan Feniger's newish restaurant on Highland, just north of Melrose, in Los Angeles. The food was incredible. All the flavors and spices I love so much. It is very much an international cuisine restaurant. Indian dishes I'm used to from growing up in Silicon Valley (where chaat houses, in particular, are a dime a dozen). Turkish doughnuts for dessert. Ukrainian dumplings with spinach, cheese, and lemon marmalade. An outstanding Pear Blossom cocktail with pureed pear and pear brandy. And something called Kaya Toast with a coconut jam filling that you dip into soy sauce and a soft fried egg. Out of this world. I could go on and on about the food. Instead, I'll suffice it to say, you must go. I LOVED it. However, there was one more element to the evening that took this delicious meal to the next level that I must mention. What could make the experience better than it already was? Um, hello? Notice a certain picture of two smiling faces at the top of this post? Yes! I not only met Susan Feniger, Susan came to our table, recommended dishes off the menu, checked back with us throughout the evening, posed for a pic with me because I'm such a Susan groupie, and tapped me on the shoulder to say goodbye to me before she left for the night. I wasn't even getting any sort of royal treatment or display of favoritism. She was wandering the dining room all night, coming in and out of the kitchen to say hello to guests at just about every table. She exudes warmth, smiles nonstop, and speaks about her food with such confidence you can't help but yearn for one more small plate. Go! Go! Go! And tell Susan that Marni sent you.